In addition to coverage of all normal behavior patterns -- sensory, communication, social and antisocial, reproductive, eating, and elimination -- this resource helps you identify medical implications of abnormal behavior, pain-associated behaviors, and effects of captivity. 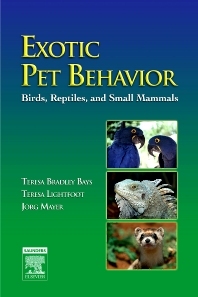 Client education handouts provide important information about caring for a variety of avian and exotic pets. A user-friendly format includes bulleted lists indicating how normal and abnormal behavior applies to species kept in captivity.